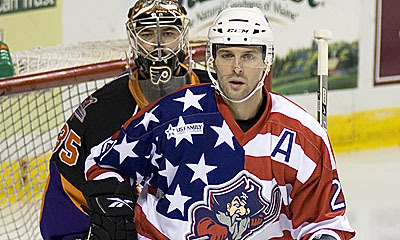 The AHL's Portland Pirates basically wore the American flag tonight when they played the Philadelphia Phantoms. And I've got a picture to prove it. That's ex-Bolt Mathieu Darche in front of ex-Pen Jean-Sebastien Aubin during tonight's 5-3 Portland victory. Look at that thing. And if the comments earlier this week taught me anything, it's that this is a gross disrespect of a great symbol — the hockey sweater. I jest, of course. But yeah, that jersey is pretty bad. I'm waiting for more pictures. I'm going to have to start building photo galleries for specialty jerseys like this. One thing at a time though.